After Mitchell's post from yesterday, I thought I would share my thoughts of having people in for drinks- but not for a minute do I think I'm an authority on the subject. I do like having dinner parties, but many times casual drinks is an easier way of entertaining. That said, I'm guilty of getting so wrapped up in work, blogging, etc, that I don't always make time to have people over. Case in point, I'd love to have my kind neighbors over for drinks (that's you, Barry and Rory), but another week goes by and I haven't played hostess. Shame on me, because it's really so easy. Enough with the excuses. So let's start with drinks. I do have a vintage bamboo bar cart that is always at the ready. I keep it stocked with the usual suspects: vodka, bourbon, gin, scotch, and vermouth. Mixers include tonic water, club soda, and Pellegrino. And of course wine for the wine drinkers. My double old fashioned glasses, bar pitcher, jigger, and cocktail napkins are also kept on the cart. I don't do specialty cocktails at my apartment, not for any other reason than I'm not the world's best bartender. (My friends can attest to the fact that I have a heavy hand at pouring, something which has left more than a few guests feeling a little queasy at the end of the evening.) Although, if I was in a festive mood, I might serve kir royales. And Southsides or Margaritas are good at this time of year. But basically, I leave the drink pouring and mixing to my guests. That means I don't get any fingers pointed at me by the end of the night. In terms of food, I keep it pretty basic. Basic does not mean that the food isn't tasty, though. Some nights it might be smoked almonds, Marcona almonds, or wasabi peas. Other times it's the block of cream cheese covered in pepper jelly or doused in Pickapeppa sauce. But the secret weapon in my cocktail food arsenal is Mamie's Cheese Wafers from Mobile, Alabama. Basically, it's slice and bake cheese wafers, and I can't tell you how good they are. Keep a few logs of dough in the freezer, and you've always got an easy and quick hors d'oeuvre. (I'm starting to sound like a commercial). While you bake them, your house smells divine too, as if you were actually baking cheese wafers from scratch. Don't forget too to have clean hand towels in the guest bathroom, and fresh soap as well. (There is nothing worse than having to use a bar of soap that has cleaned three dozen different hands.) 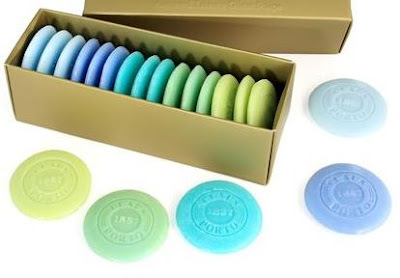 Those Claus Porto soap pastilles are great because of their small size and because they come in a box of 15. And while we're on the subject of powder rooms, I think you should just bite the bullet and get everything whipped into shape so that you can't use that room as an excuse not to have people over. I don't mean you need to renovate it or paper it in some fabulous wallpaper. All you need to do is get a nice wastebasket and tissue cover, a decent soap dish, and linens, and you're good to go. 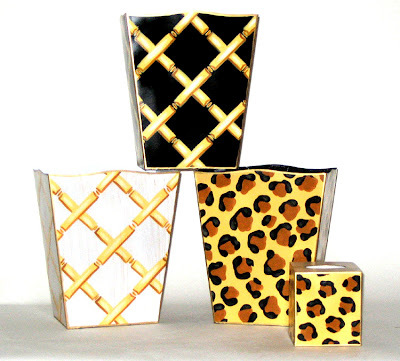 I've been eyeing these wastebaskets and tissue covers from Dana Gibson lately. See, prep work for cocktails is really quite easy. 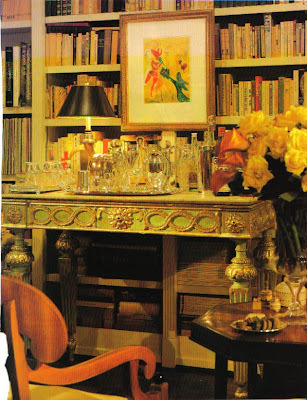 If you don't have a bar cart, set up a tray of drinks on a console table or chest top. The drinks tray at top (unfortunately, that's not mine) is so pretty and so welcoming. If you're having a larger cocktail party, get a folding table and drape some gorgeous fabric over it, one that can stand up to spills, though. P.S.- On a recent episode of "Barefoot Contessa", Ina Garten demonstrated how to get those crisp, folded edges on a drinks table cloth. For the life of me, I just don't understand the procedure. I spent half an hour the other day trying to figure it out, but it's just not working. Can anyone tell me how the heck you're supposed to do it?? 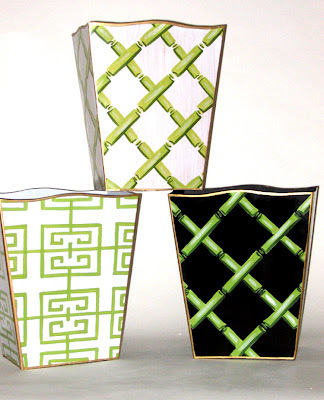 LOVE your bamboo bar cart! Also I love Dana Gibson's wastebaskets. She does lovely things-I am a great fan! We used to entertain frequently when we were younger. Now it seems we all meet out somewhere for drinks and dinner. We always enjoyed having company over so maybe I'd better get on the ball and start back in again! Jennifer, in my book you are not an amateur! The cheese wafer tip is just perfect -- oh and the soaps too! 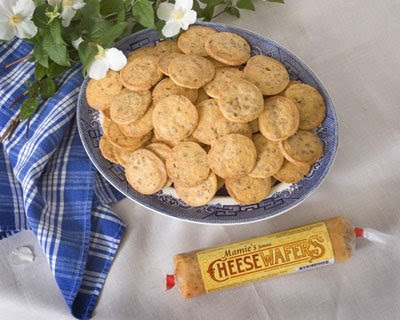 I can't tell you how many times I've used Mamie's Cheese Wafers...people go crazy for them. I used to make cheese straws from scratch and then decided why bother when these are so good and so much easier. Love these entertaining posts. Karen- Are they not the best??!! If Mamie's ever goes out of business, I just don't know what I'll do. I always have trouble slicing the cheese wafers thin enough. Any tips? Mamacita- A sharp knife and cold dough is the best way to do it. That said, mine are never very consistent in thickness. I love all your tips. I especially want to try the Mamie's Cheese Wafers. I just visited the website and they are sold at Harris Teeter's. I will call to see if mine has it. 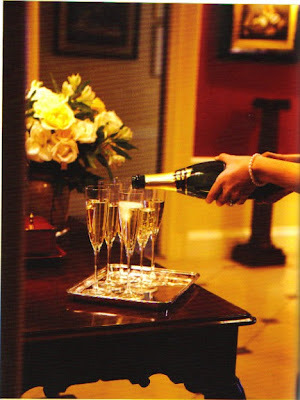 I have really enjoyed these last two posts on entertaining tips. Never heard of Mamie's cheese wafers. They sound much easier than the cheese puffs with olives I've been making ahead. Unfortunately my terrier has trained me not to have open wastebaskets. Your ideas look great. I just read the previous post and laughed about the Veuve Cliquot guest. And I love moving people away from the dinner table. One thing I do for parties, since I can't hire a server for the night, is invite an inner circle friend to do the mixing for me. Often I try to sort of cohost with them(they can invite too), so that as a single woman, I can get around some, and also get people out of the kitchen. I'd love to try those pastilles - how pretty on a decoupage plate! Tickled Pink- I tried to take a photo last night of the cart but the lighting was terrible. I'll try to post one soon! Balsamfir- I make olive puffs too and everyone- myself included- inhales them. As for the crispness of the edge of a table cloth-- after the first fab cocktail and lively conversation, it's beyond anyone's concern. A perfect post to inspire us for some weekend entertaining. Your wonderful posts on cocktail parties and entertaining reminded me: for the BEST recipes -- and a hilarious fun read -- try "Being Dead is No Excuse - The Official Southern Ladies Guide to Hosting the Perfect Funeral" -- by Gayden Metcalfe and Charlotte Hays. Be sure to read about the "controversy" over such things as "sweet or savory is preferable in stuffed eggs" (*pages 78-82). BTW -- the authors call them "stuffed eggs" rather than "devilled eggs"! At one of my girlfriend's pool parties (late afternoon drinkies and nibbles) -- sections of this book was read aloud by each of the guests. And we laughed so hard that the martinis did not need to be shaken! LOL! I need to entertain more this way, dinner is always a big affair and I can't enjoy my guests as much. Thanks for the tips from both posts. Well done! Mamies & Dana Gibson in one post...hurray!!! I first had Mamie at a party in Atlanta & now ship them in. They are to die for!!!! You can make I once rolled the entire thing out and used it for a quiche crust...holy moley!!! The crispness in the lines is good old fashioned starch in the waterduring the oak cycle Spray sizing just doesnt perform the same crispness. Also line dry til damp..then iron. Crisply clean!!! The cheese wafers sound delightful-well of it all does- and I am sure it is just the PEAK OF CHIC at your house! I just checked Mamies website and I am ordering right now. I am going to bring the south to San Francisco! My next big dinner party is in a few weeks and we will think of you! Cheers to cocktail hour! PS. Teach Alfie how to mix a martini- but as Auntie Mame says- don't bruise the gin and also her tip that olives take up so much room in such a tiny glass. You are not an amateur! I love all of your ideas. I'm not a good entertainer at all. But, you've inspired me...I'm off to buy some Mamie's wafers and possibly those soaps, which actually match my bright green 30's bathroom! Thanks for the inspiration. Now I need to read your post about Mitchell Crobsy! Paris- Thank you for the kind words! A 1930s bathroom??!! That sounds wonderful. I have a 1968 bathroom- not so wonderful! I am on a mission, to find an old bar, a bamboo one,I am even thinking of having it made. Last summer we had a "Summer Solstice" cocktail party and it was all on our patio, and the bar I rented was perfect. I had so much fun stocking it and then hiring the prettiest bartendress in the land. Getting the crisp edge, simply run your fingers like you would on the edge of an hermes box. I'm so silly.... OfCOURSE it would be called "boxing" a tablecloth. Hope this helps! Cheers!!! !